Fish en papillote, or “steamed in parchment”, is a thing of beauty. Not only does the fish get to cook in its own juices, but also the juices of anything you add to the parchment pouch (vegetables, liquids, etc.) This creates a fusion of flavors that will surpass your expectations and knock your socks off every. flippin’. time. The fun part is that once you’ve followed a few recipes for fish en papillote and are into the groove of it all, you’ll be confident enough to create your very own flavor junctions. Whether you’re in the mood for Italian, Mexican, or East Asian, there’s a delicious combination to be made, and it will always come out a winner. 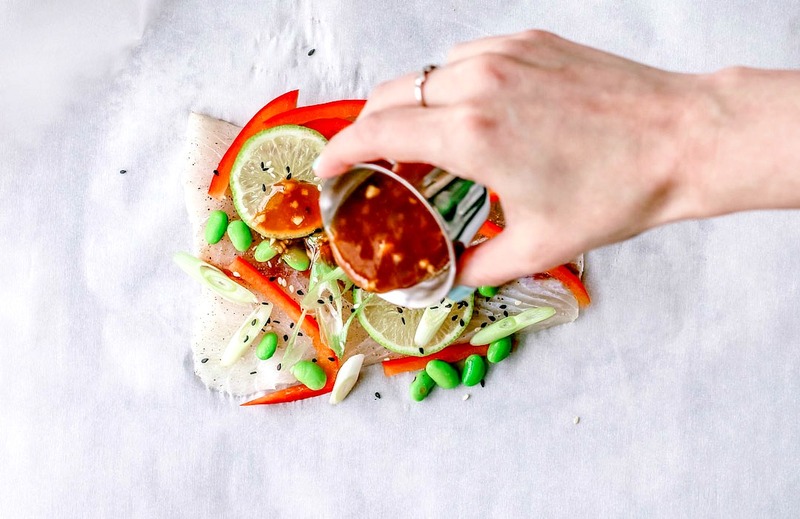 This recipe takes you the East Asian route with a lip-smacking homemade soy and ginger sauce, crunchy strips of red bell pepper, edamame, zippy scallions, and meaty barramundi. Australis Barramundi, also known as The Sustainable Seabass®, is a great alternative to halibut, grouper, snapper, or Chilean sea bass all year round. It’s mild in flavor which makes it extremely flexible and easy to pair with any cuisine you’re craving, whether you’re a regular fish eater or just starting to dip into the world of seafood. Australis Barramundi is on a healthy and sustainable mission. Many people are working toward healthier lifestyles and choices these days and, due to health benefits, fish is becoming a more popular choice. Australis Barramundi is high in omega-3’s and protein. It’s also raised without antibiotics, hormones, or colorants, and free of mercury, PCBs, and other contaminants. On top of that, Australis Barramundi was built on a holistic view of sustainability. It’s the *first* ocean-farmed fish to earn the Best Choice rating by Monterey Bay Aquarium Seafood Watch® program! As they reimagine the future of fish through Climate-Smart Ocean Farming, sustainability is a priority, not an afterthought. Salty, garlicky, and a little sweet, this fish is elegant enough for Sunday dinner but easy enough for weeknights! Place your parchment packages on a baking sheet alongside your fave seasoned veggies, roast for 12 minutes and you’re golden. The best way to serve these packets is to keep them sealed so that each individual gets to tear their parcel open at the table, like a little gift, and enjoy the aroma that releases from the pouch. This is a fab idea if you’re hosting a dinner party! Not sure if Australis Barramundi is available near you? Find out here! Making this recipe? Snap a pic and tag me on Instagram: @Killing__Thyme /#killingthyme. For more delish eats, follow me on INSTAGRAM + PINTEREST. This Soy and Ginger Fish Steamed in Parchment is elegant enough to be your Sunday dinner, yet quick and easy enough for weeknights! 1/2 tsp miso paste (optional) I like to add miso if I have it on hand to enrich the flavors a bit, but it's optional; sauce is enjoyable without it! Remove fish from packaging, season with salt and pepper, and set aside. Add all of the sauce ingredients to a bowl and whisk until well-blended. Set aside. Tear/cut parchment into segments — one segment per fish. The size of the parchment depends on the size of your fillets, but you should be fine with a piece of parchment that measures approx. 13 inches wide. Lay each segment down on a flat surface. Place each fish fillet in the center of the parchment paper and top with garnishes; feel free to add your own fave veggies to the mix. Drizzle half of the sauce over one fillet, and the rest over the other. Once everything is in place, take one of the sides of your parchment and fold it over the fish. After that, grab the other side, and fold it over enclosing the fish. Twist the ends of the parchment one at a time, securing each one by tying butchers twine around it. Place on a baking sheet and bake for 12 minutes, or until fish is opaque, flaky, and has an internal temperature of 145 degrees F.
When done, transfer the parchment packages to plates. Packages are to be opened at the table and eaten out of. So nice to see you doing this Dana. I think that en papillote cooking is seriously under-utilized and underappreciated. It's a great and simple way to work with a nice dense white fish like barramundi. But most importantly, I'm glad you went with the the soy/ginger flavour combination. It's so easy to default to a French style of cooking en papillote (and hey, white wine and fish do go nicely together), but I really like this style. It's actually somewhat reminiscent of the awesome East Asian steamed fish dishes you can make/get where a whole fish is used. Yum. This looks like a flavour-packed healthy dinner! I agree with you that food cooked in parchment paper is infused with such wonderful flavours and fragrance, Dana. I look forward to trying your quick to make delicious and healthy recipe. "En papillote" is one of my favorite ways to cook fish. It always comes out so juicy and tender. I've had barramundi in restaurants and have loved it, but haven't cooked with it much at home. That's going to change when I make this recipe! love all the vibrant colors int he photograph! I love the idea of cooking fish in parchment and covering it in a delicious sauce like this one. I'll bet it's full of flavor! I try to make fish at least 2-3 times per week and I'm always looking for new recipes. Your photos are gorgeous! The Australis Barramundi sounds really good too and it is good to know that it is farmed with sustainability in mind.